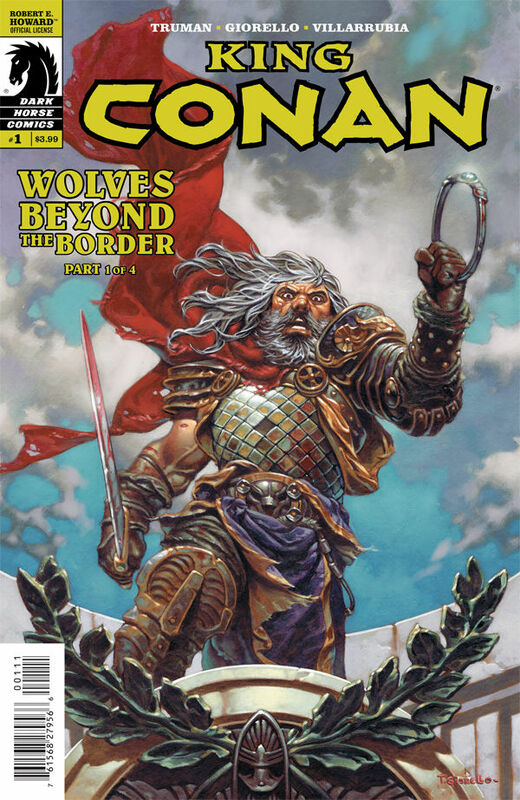 Based on an unfinished Robert E. Howard story, the fan favourite creative team of Timothy Truman and Tomás Giorello expand the premise of ‘Wolves Beyond the Border’ placing King Conan at the centre of the story, as opposed to his peripheral involvement in the original text. The Conan we see here is restless and bored, his days of high adventure long since behind him. Seeking any form of action, he ventures incognito into the citadel’s worst hostelries in the hope of engaging in a bloody brawl, or finding a quest to undertake; anything to make him feel alive. Before long, an embattled warrior named Gault offers the very tonic, recounting a tale of betrayal and an impending danger, before presenting the King with an ancient crown forged from Pictish Iron and an Atlantean jewel. The relic’s dark power soon takes hold, and a mysterious voice mockingly challenges our hero to quell the growing threat of war. The first thing you notice about this book is the magnificence of Tomás Giorello’s insanely detailed art. Each and every locale and character is meticulously rendered, from each character’s nuanced facial expressions, to the visual opulence of the environments, it’s a visual tour de force, grounding this fantasy tale in a solid realism. Conan in particular is imbued with an almost God-like quality (especially in the cover image), his presence, power, and ferocity highlighted through clever framing, and brilliantly staged action sequences. As an added touch, his dialogue is presented in harsh, ragged captions that conjure a gravel-like voice in your head, banishing the Austrian Oak’s dulcet tones to the wheel of pain forever. Truman’s writing stays faithful to the traditions of Howard’s work throughout, and he clearly has an educated ear for the language of fantasy. The typical elements you’d expect, such as the grandiloquent third-person narration is nicely balanced by a more down-to-earth script, which retains its fantasy flavour. This opening issue is fairly plot heavy, which is to be expected, and riffs somewhat on the central narrative of The Lord of the Rings, but its familiarity doesn’t detract from an engaging opening salvo. I hadn’t been exposed to this creative team’s work before now, but it’s easy to see why they are considered fan favourites. This first issue sets up the inevitable adventure in engrossing fashion, and features some truly terrific artwork that is worth the cover price alone.